Michael Manni arrived at a rest stance on St. Pauli Girl, a 5.10c at New River Gorge, West Virginia. He wanted to keep going without resting but I coached him to stop, rest, and assess. It had only taken Mike nine months to be able to climb 5.10, but it seemed to just get him to his performance plateau quicker. Being on a plateau can be frustrating but Mike decided to be open to training and suggestions from others. He heard about a Sport/Mental Camp I was teaching at the New so he signed up. There seemed to be an overall nervousness to his climbing, like he wanted to get it over with. There was a lack of deliberateness when he climbed and in his utilization of rests. This lack of deliberateness seemed to be his weak link and I was going to help him with it. 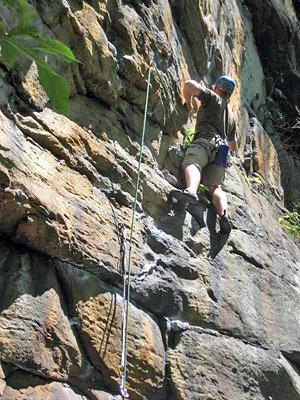 Many climbers think that when they get on a route they must climb it to the top without stopping. They associate being deliberate with continuing to climb. Being deliberate, however, is committing fully to something specific. Climbing is not just moving from bottom to top without stopping. Climbing consists of both stopping and moving. At stances you stop rest and prepare; between stances you climb. But, you also need to blend these. This blending is a transition. Negotiating these transitions is critical for creating deliberateness. A route has many transitions. Each transition is a kind of decision point. You transition from preparation to action at these points. A typical decision point is when you are stopped at a stance with protection. Each decision point contains a transition where you stop preparing and begin acting. Knowing what takes place in transition helps you make it more deliberate and complete. There are three steps in effective transitions. First, you let go of the old. Second, you allow yourself to “be” in the neutral zone. Third, you embrace the new. Let’s apply this process to a decision point on a route. At a rest stance you assess and plan. This is your preparation. Once you’ve finished preparing you get ready to act, but you haven’t acted yet. You are in transition. • Letting go of old: First you let go of preparation. You’ve assessed the situation and more assessment isn’t useful. Many climbers keep on assessing until doubts permeate their mind. Assess well but then make a conscious decision to stop assessing. • Neutral zone: Second, you settle into the neutral zone where ambiguity is high. It is ambiguous because you have let go of the comfort of staying there and preparing, yet you haven’t begun climbing. You are in-between two known activities, a no-man’s land of sorts. • Embracing new: Third, there is a moment right before engaging where you consciously embrace the new. The neutral zone dissipates as the new course of action solidifies in you. You know that in the next moment you’ll climb and knowing that finalizes the ambiguity of the neutral zone and the transition. The learning process also contains transitions. In fact, if you are poor at transitioning in how you learn you’ll transition poorly on a climb. In learning you have to let go of the old way of doing things, “be” in the chaos of not knowing, and then embrace a new way of doing things. “Being” is the neutral zone of transition. You can’t latch onto the old or the new for security. You must “be” with the chaotic state of the in-between. If you habitually latch onto the security of what you have done or what you will do, then you don’t allow space for new learning to develop. This habit of latching onto security manifests itself in climbing as rushing or stalling. With rushing you climb through rest stances and latch onto the security of getting the stress over with. With stalling you stay where you are and latch onto the security of the rest stance to stay out of the stress. Neither of these are deliberate and they don’t prepare you for the growth you could experience. “Being” in the in-between prepares you. Mike felt out of control and rushing gave him a way of getting rid of the ambiguity of the neutral zone. But rushing didn’t give him control. He would need to slow down to gain true control. This would be the new behavior he would apply. • Let go of old: He would consciously let go of preparation and enter transition. This only takes an instant, but it has to be done consciously. He would verbalize this by saying “Done.” This is a conscious and verbal command that deliberately emphasizes letting go of the old. • Be in the neutral zone: In the neutral zone he would practice “being” without acting on the desire to rush into climbing. Rushing is the old concept he has about how to climb. This concept is in his mind. Mike would deliberately direct his attention out of his mind and into his body to diminish falling into this old concept. He did this by heightening his state of arousal: doing a couple strong exhalations, shaking his face, and doing several eye blinks. Doing this keeps attention in his body, preparing the ground--the foundation--for new growth to occur. By creating a heightened state of arousal in his body he keeps attention out of his thinking mind. If his attention stayed in his mind he would create new concepts to latch onto. New concepts should be created later, when the mind processes the experience that the body had. • Embrace new: He would embrace climbing the next section an instant before actually committing to it. He would verbalize this by saying “Go.” Again, this is a conscious and verbal command that deliberately emphasizes the end of transition. With this agreement he engaged St. Pauli Girl. When he reached a stance I could see his tendency to move off it too quickly. I coached him to stop and prepare for the next section, which he did. Then I told him to let go of preparation when he was finished. When I heard him say “Done” I knew he had deliberately let go of preparation. He was now in the neutral zone. I coached him to heighten his state by reminding him to do a couple strong exhalations. After doing this I heard him say “Go” just before he committed to climbing. He climbed to the next stance where he repeated this process. He climbed this way past the fourth bolt and fell. He applied transitioning, something he was uncomfortable doing, to a challenging grade at his current ability level. Later, Mike told me it was difficult to slow down. He was reluctant to climb as I suggested but figured I must have a reason for it. Slowing down and doing the transition took a lot of Mike’s attention. He didn’t see immediate results, but he persisted in applying what I suggested. With practice he noticed that he regained energy at rest stances and placed his feet/hands better when climbing. He felt less anxious, more in control, and more deliberate. He also noticed that his approach to learning had changed. Initially he was reluctant to do what I asked because rushing “worked” for him. But, he allowed himself to “be” in the in-between where he had to let go of his old way of relying only on his methods. He deliberately embraced a new method suggested by someone else and was patient in practicing it. He had allowed himself to be in the neutral zone where the foundation for his learning could develop. Climbing a route isn’t a continuous process of moving upward once you step off the ground. It is a series of stop/climb cycles. Transition helps differentiate between the two and helps do each deliberately. Understanding transitions allows you to let go of the old, “be” with the ambiguity of the in-between, and embrace the new. Develop this skill in how you learn and you will apply it well when transitioning on climbs. Without developing this skill you are destined to stay latched onto the security of your old behavior, which will keep you permanently marooned on your plateau. Incorporate effective transitions to create deliberateness in your climbing. Begin on moderate routes and increment up to routes that are at your limit. Pick a climb and divide it into decisions point, places where you have rest stances and protection. Let go of preparation by saying: “Done.” This is a deliberate confirmation that you have finished preparing. Enter the neutral zone by directing attention into your body. Do this by heightening your state of arousal. Take a couple breaths, exhale strongly, and shake your face to get rid of any tunnel vision. It is also helpful to blink your eyes a few times. This heightened state lets you know you’ll let go of the comfortable stance soon and begin the exertion of climbing. You’ve let go but haven’t engaged yet. This neutral zone should be about the length of time that it takes to do two or three breaths. Embrace climbing by saying: “Go.” Do this an instant before committing.